Riegl now offers several new sensors and systems for airborne data gathering at various elevations. 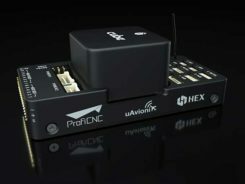 At Intergeo 2018, the company unveiled sensors designed for low-flight altitudes, such as with UAVs. Riegl also introduced sensors designed for medium-flight altitudes used in large UAS/UAV/RPAS with higher payload capacity or in manned helicopters, and scanners and systems for data acquisition at high flight altitudes using manned fixed-wing aircraft. Medium altitude. The Riegl VQ-480 II (Mark 2) and VQ-580 II (Mark 2) are designed for airborne applications at mid-altitudes for use on both manned and unmanned aircraft. Based on the capabilities of their predecessors VQ-480 and VQ-580, their new, sophisticated designs lead the quality of the systems to a new standard of performance and user-friendliness. Both offer a measurement rate of up to 1,250,000 measurement/second and a wide field of view of 75 degrees, suitable for corridor mapping, city modeling and applications in agriculture and forestry. With approximately 10 kg of weight, they are ready for integration into helicopters as well as unmanned UAVs with a higher payload capacity, and are compatible with stabilized platforms and even small hatches. 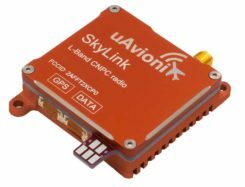 The VQ-480 II and VQ-580 II are prepared for smooth GNSS/IMU integration, offer interfaces for up to five optional cameras, and are equipped with a removable storage card and an integrated SSD for data storage. While the VQ-480 II works at a laser wavelength of 1550 nm, the VQ-580 II works at 1064 nm wavelength suited to measure on ice and snow. Laser scanning. 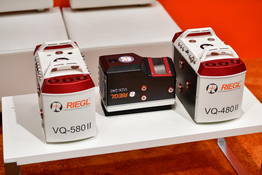 Riegl’s VUX series, focusing on unmanned laser scanning, has also been expanded. With the Riegl VUX-240, a new airborne lidar sensor with less than 4 kg weight and a sophisticated design offering 75-degree field of view is now ready to be integrated on both small manned and larger unmanned aircraft. The high measurement rate of 1,500,000 measurements/second and a high scan speed of up to 400 lines per second are the basis for high scan efficiency, especially in applications like power lines, railway tracks, pipeline inspection or topography in open-cast mining. Interfaces for an optional GNSS/INS system integration and up to four optional cameras are further convincing key features of the new scanner. Bathymetry. 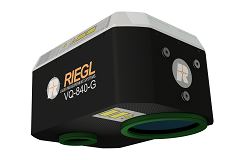 For the bathymetric segment, the Riegl VQ-840-G has entered the marketplace. Designed for combined topographic and hydrographic surveys for use with large UAVs from lower flight altitudes, the scanner carries out laser range measurements for high-resolution surveying of underwater topography utilizing a green laser beam. 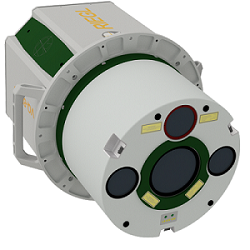 The scanner’s compact, lightweight and robust housing also can include an optional digital camera and an additional, fully integrated infrared laser rangefinder, and is compliant with typical hatches in aircrafts and with stabilized platforms. Airborne laser scanning. The Riegl VQ-880-GII is a further improvement of the VQ-880-G topo-hydrographic airborne laser scanning system, offering online waveform processing and full waveform recording. The improved setup includes a green laser channel, an integrated infrared laser channel, and an integrated dual camera system for RGB and IR. Typical applications include coastline and shallow water mapping, acquiring base data for flood prevention, and measurements for aggradation zones. Also available are the VQ-780i airborne laser scanner and the VQ-1560i dual wavelength airborne mapping system.